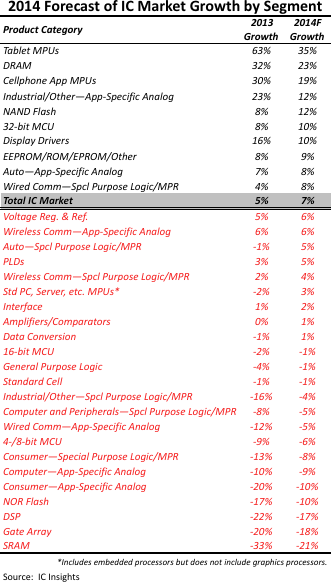 IC Insights has forecasted the top IC chip product categories by growth in 2014. Tablet MPUs, DRAM, and Cellphone Application MPUs, are forecast to exceed the 7% growth rate forecast for the total IC market this year, with seven of the ten categories forecast to enjoy double-digit growth. The number of IC product categories with positive growth in 2014 is expected to increase to 19 from 15 in 2013. Consumer-driven mobile media devices, particularly smartphones and tablet computers, are forecast to keep the Tablet MPU (35%) and Cellphone Application MPU (19%) segments at or near the top of the growth list for the fourth consecutive year. Other IC categories that support mobile systems including NAND flash (12%) and Display Drivers (10%) are expected to enjoy better-than-industry-average growth in 2014, as well. In 2013, the volatile DRAM market reappeared among the top-growing IC markets with 32% growth due to a big jump in the DRAM average selling price (ASP). DRAM average selling prices are forecast to show another big increase again in this year, propelling the DRAM market to a 23% increase, the second-fastest growing IC product segment in 2014, according to the forecast. Demand for medical/health electronics systems and the growth in connectivity using the Internet will help the markets for Industrial/Other Application-Specific Analog and 32-bit MCU devices outpace total IC market growth in 2014. Also, the “intelligent” car is another hot market for 32-bit MCUs, which are incorporated into driver information systems, throttle control, and semi-autonomous driving features such as self-parking, advanced cruise controls, and collision-avoidance systems. In the next few years, complex 32-bit MCUs are expected to account for over 25% of the processing power in vehicles. In a world that is increasingly wireless, the Wired Comm—Special Purpose Logic/MPR is forecast to grow 8%. All wireless traffic eventually goes through high-speed cable transmission "backbone" networks. Communications are routed over long distance via optical cable before getting to the cellular network on the other end. All the mobile Internet, data, and video traffic has to go through a cable network and that is keeping the market for Wired Comm—Special-Purpose Logic/MPR devices growing at a steady pace.